Oh, Maxim. You’re so funny and clever! Burn city! Population: Manti Te’o! LOLZ. 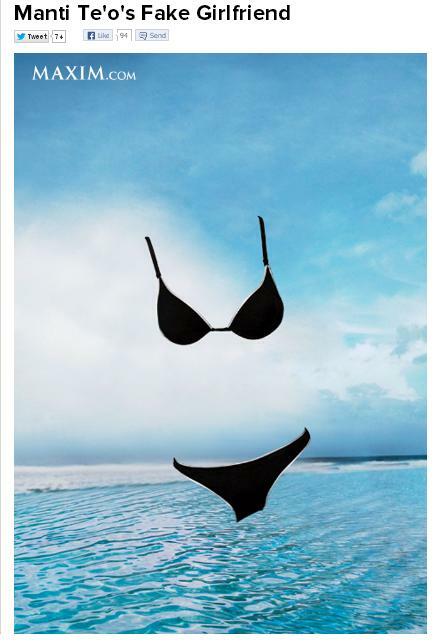 After Manti Te’o’s fake girlfriend hoax of 2012, we think it might be nice to have an invisible girl of our own to love. Why not? She’s got a ton of great qualities, including looking awesome in a bikini. ZOMG! This is hilarious!!!!! Guess what spot they gave Lennay on the list? Just guess. Ready for it? 69!!!!! SIXTY-NINE!!! HAHAHAHAHAHAHAHAHA! Maxim mag! You kill me!! Maxim magazine is run by morons. I’ve had the pleasure of dealing with Maxim personally. I had posted a bunch of photos of Ryan Tannehill’s hot wife, Lauren Tannehill, and Maxim didn’t like that. They proceeded to threaten me in a series of emails from their Director of Photography at Maxim Magazine. (a great read if you like condescension and snark) So, after this experience, it’s no surprise to me that Maxim used their pea brains to take a shot at Manti with a tired, tired joke. Apparently, Maxim is still living in this world: Manti Te’o Fake Dead Girlfriend Jokes are HYSTERICAL. It’s sad, really. This entry was posted in Celebrities, Football, News, NFL and tagged Manti Te'o, manti te'o deal with it, manti te'o hot 100, manti te'o maxim, Manti Te'o's girlfriend, maxim hot 100, maxim lennay kekua. Bookmark the permalink.